The southern part of The Pits borders on the Pompton River which forms the boundary between Morris and Passaic Counties. 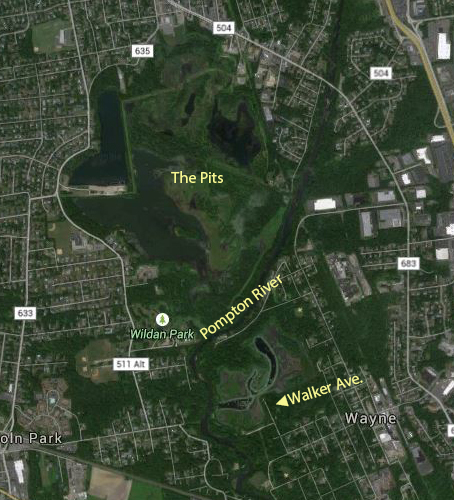 Directly on the south side of the Pompton River and across from The Pits is a gem known as the Walker Avenue Wetlands (Walker Ave.) in the township of Wayne. Granted, this is in Passaic County and mocosocoBirds focuses on Morris and Somerset Counties but The Pits and Walker Ave. are joined at the river, so to speak. It is unfair to think of one without the other. This observer on many occasions has watched herons, egrets, shorebirds, etc. fly south over the southern treeline of The Pits, more than likely headed for Walker Ave. The eBird hotspot for Walker Ave. lists 184 species. The link for the hotspot is here. A Reeve (the term for a female Ruff) was here during the summer of 2002 propelling Walker Ave. into the New Jersey birding consciousness. Stilt, Baird’s and Buff-breasted Sandpipers along with Wilson’s Phalarope have also been recorded at Walker Ave. Viewing the eBird hotspot will show the reader an impressive species list for this location. Use Walker Avenue in Wayne to access the wetlands. Park at the end of the road and explore. This morning, after wondering where the Great Blue Herons and Great Egrets that were seen in double-digits at The Pits the past week had gone, a trip to Walker Ave. showed they had moved to Passaic County. 30 Great Egrets and 26 Great Blue Herons were in the northeast section of the wetlands in the late morning. The above photo shows approximately half of them. Also present were Green Herons, Wood Ducks, an immature Bald Eagle flying low over the wetlands, which the herons and egrets ignored, Lesser Yellowlegs, Least Sandpiper, etc. The screenshot of a map below shows the general layout of The Pits and Walker Ave. and the human congestion surrounding the area creating an oasis effect.